Eh. Honestly with 7 or main characters to focus on, someone was gonna get the short end of the proverbial attention stick. Personally I liked Pohatu just fine in this. When we initially set out to make the movie, we aimed for something like "30-45 minutes." When Eljay, Ven, and Var had hammered out the script and we did the first table read, that time was something like an hour and 20 minutes (not accounting for the laughter and shenanigans that occurred during). It's crazy that it still feels short in spite of that. 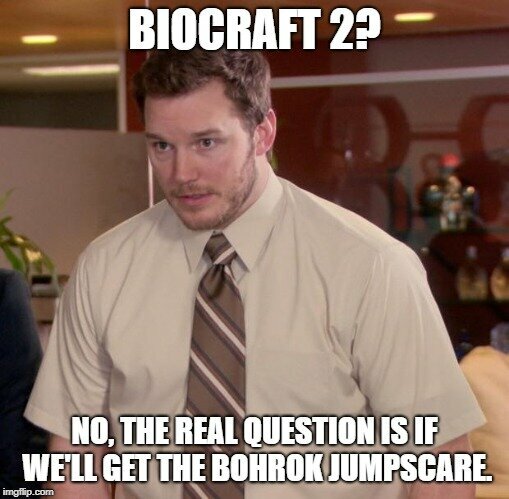 However, in hindsight I truly believe that the Original Biocraft's failing was that from the start we wanted to create a "feature length movie." I think there's something to be said for intending to make something small in scale and naturally having it evolve into something grander. Unfortunately, the Rahi will always be weird. Eljay had/has an understandable aversion to modding Minecraft in order to fully realize stuff like the Rahi. When you're limited by the player models that already exist in Minecraft... well, textures can only do so much. That isn't what we should be asking. Oh No, No no no, I like this. This stays. I think it all turned out great. I loved every moment. I originally asked for that post back so I could revert it from is non-meme form. But I am sort of happy and humbled that a mod deems it valuable to stay lol. The BioCraft Original Soundtrack is now officially available for streaming/purchase! will you put it on Bandcamp? I can assure you that it's legitimate.